Will They Believe Your Case? If you have ever proposed an IT action or investment and then failed to gain approval or failed to deliver expected returns, you may find here just what was missing from your business case. IT ROI figures still fail to “come true” and still raise cries of “Soft Benefits!”. Solution Matrix Limited has worked with many dozens of CIOs, IS/IT directors, and financial executives, worldwide, building the business case for planned IT actions and acquisitions. This article presents some practical findings from this experience—proven tactics for building-in credibility and accuracy to the IT business case. These managers began with a wide range of personal motives and needs. These managers started with a wide range of personal motivations and needs. Some focused on getting funds for specific IT projects, while others wanted high level "buy-in" for strategic decisions, and a few needed to justify their stewardship of IT money over the last few years. What they had in common was a need to build an accurate, credible business case. Most had already developed positive ROI figures of their own before we started working together (few had started out expecting to show a net loss). To an individual, however, they reported frustration in trying to “sell” the business case inside their organizations. Few were truly comfortable with their ability to estimate IT costs and benefits in advance. Systematic (have good models and rules for finding and summarizing values). Financial talent also helps as does a solid grasp of the interplay between IT capacity, service levels, user needs, and IT resource requirements. Intelligent managers appreciate this much already and—as you know if you’ve heard from the IT consulting community lately—there are methods on the market claiming these virtues. Nevertheless, IT ROI figures still fail to “come true,” still raise cries of “Soft Benefits!” and fail to instill confidence in senior management. Why? What can IT managers do about it? Following are nine critical contributors to business case success—requirements for success in many cases—that are not always present. If you have ever proposed an IT investment and then failed to gain approval or failed to deliver expected returns, you may find here just what was missing. If you are about to propose an IT acquisition or action, consider how you would address the issues behind each item. The nine keys below can work well with most good approaches to business case building. They are especially applicable, however, with the business case structure and content presented in Business Case Essentials (www.business-case-analysis.com/business-case-essentials.html). Who are the stakeholders whose costs and benefits belong in the case? Which business objectives does the benefit address? "Full value" vs. "Incremental scenarios." With which approach should you lead? How long is long enough? Sensitivity analysis: What happens if assumptions change? You may not succeed in giving a financial value to every "benefit." Make it tangible and connect it to business objectives. The article Business Case provides a complete introduction to business case analysis and the process for building the business case. For a more in-depth introduction to the IT business case, including numerical examples, see the ebook Business Case Essentials. Visit the Master Case Builder Shop. Download Ebooks & Software Today! If you are preparing a business case for your management, and your organization is the primary beneficiary of the proposed technology, it is tempting to take sole responsibility for building the evidence that will justify it. It is tempting to have your staff find all the costs and benefits, give yourself the job of adding up their cost/benefit lists, and then present the results to your manager or the Capital Review Committee. If you are a consultant building the case for a client, it is also tempting to do the case yourself—to be sure it comes out "right" and to highlight your expertise and value. There are serious risks, however, in the "solo" approach to building an IT business case. The problem is the nature of information technology in business today: IT is integral to almost every functional area and IT actions have financial consequences that cross boundaries of all kinds (organizations, management levels, budget categories, planning periods). All of this adds to the reasons for recruiting and cultivating a cross-organizational, cross-functional “Reference Group” to help you design the case and establish credibility. This group is not the project team that does the hard, time-consuming work (digging into databases, interviewing experts, analyzing workflow in detail, and so on). In some organizations, these groups carry names such as the "Review Committee," "Steering Group," or something similar, because this group plays a specific "executive" role. When recruiting a Reference Group, try to include IT users and their managers, senior financial managers, and other high-level executives directly responsible for the company’s financial performance. Look especially for senior managers in organizations and functions outside your own that will be impacted by your proposal: these people are genuine “stakeholders” in your plan. Also, try to include subject matter experts in areas such as finance and human resources. Line managers on the team can help “cost” and “value” the operational impact of IT actions in their areas (manufacturing, procurement, marketing, sales, customer service, facilities, shipping, etc.). A financial expert can help connect the IT business case with the organization’s long-range business plan—a great aid to “sizing” IT contributions to expected business benefits. A Human Resources expert can help identify and gauge the “people costs” of the action: job levels, salaries, overhead, training requirements, hiring and relocation, and so on. Very senior managers should be able to help prioritize, legitimize, and assign a value to any IT contributions to the organization’s strategic business objectives. That much of the Reference Group role is obvious. Some other functions for the team are less prominent but equally valuable. The Reference Group can be the vehicle for spreading a sense of ownership for the business case. Those who get involved with producing a business case develop a sense of ownership for it. In meetings and discussions, as team members contribute to case design and development. Inevitably, it becomes their case coming up for review as well as it is yours. That is an advantage for you, because most people do not want something they work on, and own, to fail. In a competitive or critical setting, your case design methodology and significant assumptions will not have to be announced and defended at the same time—if they are worked out early and communicated widely by the Reference Group. The IT business case report has a lot to communicate, in fact, usually too much to get across in a single reading of a case report or a slide presentation. The Reference Group can serve as an active communications channel between the case building team and the people and organizations who will be impacted by the proposed IT action. By opening the communication channel during case building, before delivering the final report, before the final results, Reference Group members can help set expectations for the business case results and establish the rationale that legitimizes benefits for the case (see Key 3 and Key 4 below). When review day comes, critics may still argue your interpretation of case results, but you leave them little room to question your methods or data, and you avoid critical surprises late in the game. If the IT action analyzed in your business case has cross-functional, cross-organizational impacts (and most IT actions do), you will very likely have to check assumptions, research impacts, and gather data from sources outside your organization. Reference Group members can help “open doors” and direct you to the right people in their organizations who can provide that information. Finally, you may be able to use the Reference Group as a useful tool for handling people who are severe critics of your proposal. If you face people who fit that description, it may be advisable to bring one or more of them onto the Reference Group at the outset. Business Case Essentials. The Best-Selling Case-Building Guide in Print! How do we know the business case includes all the costs we will incur over the next few years? How do we know that we are comparing alternate action options fairly? How do we keep the lifetime costs of this investment under control? How do we avoid unpleasant cost surprises later? A good IT cost model for the business case will help you address all three kinds of questions. In fact, one of the first tasks for the case-building team should be to design and agree on the structure of the cost model. A useful first task for the Reference Group is to complete and approve the cost model for the business case analysis. The cost model is critical because the link between technology and specific costs (and benefits) is often unclear or hidden, and because you need a rational system for deciding which cost items belong in the business case and which do not. The first purpose of the cost model is to help the case builder and Reference Group identify all relevant costs for the case and reach a high comfort level that the cost side of the analysis is complete. A good model shows every possible place to look for material cost impacts of the IT action. It clarifies which items and data to omit, as well. Should your IT business case include the cost of user training? Should it cover outside consultant fees? You won’t have to anguish over a response if you have already established a cost model that is clear, appropriate, and unquestionably complete. The second purpose of the cost model is to communicate completeness and fairness to all who read and use the case. When a model’s completeness is self-evident, and its boundaries are clear, it becomes a vehicle for assuring others that you have been complete, and your case is free of personal bias in deciding what to include and what to exclude. For the cost model example in Figure 1 below, completeness should be self-evident: Anyone familiar with the IT proposal should be able to judge the selection of categories on both axes and agree that each axis covers all relevant cost types for that dimension. Figure 1. A simple sketch of the cost model categories helps communicate which costs appear in the IT business case. The yellow cells in this example represent IT cost classes that are obvious and easily anticipated, while the white cells represent cost categories that are easy to overlook. Analysts sometimes refer to these latter cost types as "hidden costs" when analyzing the full range of IT costs. When the business case compares alternative IT actions, the cost model can also demonstrate clearly that the analyst is comparing costs in different action scenarios fairly. The analyst uses the same cost model to identify cost impacts in all "scenarios. "If the choice of cost categories for the model unfairly favors one alternative over another, that bias should be more evident to all in the cost model structure than from a simple list of cost items. Your IT business case may include hundreds of individual cost items, but you should be able to sketch the cost model in simple terms and use it to demonstrate that all the relevant cost categories are present. Table 1 below is a more detailed version of the cost model in Figure 1. This example, in fact, is a representative IT cost model that has proven very useful across a wide range of industries and IT actions. It is a "Resource-based" cost model because it shows us all IT cost impacts within resource classes. Table 1. An IT cost model that can be adapted to estimate the total cost of ownership (TCO) for a wide range of IT actions. 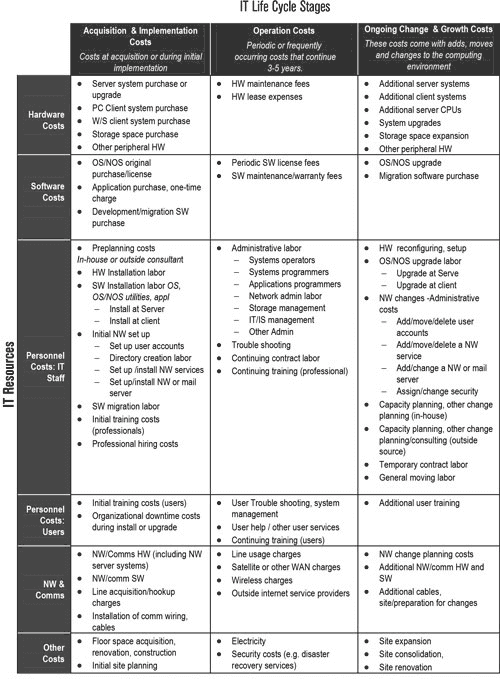 Rows represent IT resource categories, and columns represent different kinds of IT lifecycle events or lifecycle stages. Management plans and manages the cost items in each cell together, and they may have cost drivers in common. This example is an instance of "resource-based" cost modeling because the vertical dimension of the model matrix presents all of the IT resource categories that need cost estimates. A cost model built this way is nothing more than an organized list of all possible cost impacts. The key to its value is in the organization: each cell is a set of related cost items. Items within a single cell are generally costs that change together and need to be managed and planned jointly. The cost model is, in fact, is designed to capture "total cost of ownership" (TCO) for the IT action, across a 3-5 year period. The model includes categories intended to capture "obvious" IT costs (HW and SW acquisition, for instance) as well as IT cost impacts that are real but often overlooked, or "hidden" (such as the full range of personnel costs, or ongoing growth and change costs). The cost model sets the rules for which costs belong in the case and which do not. The cost model design, therefore, should be completed before anyone on the case building team begins attempting to project cost or benefit consequences. Once the subject, purpose, and scope of your case are defined, priorities on the case building team should turn to cost model design. When the case building team agrees on the appropriate rows and columns for the model and begins to identify some of the cost line items, the Reference Group should meet to suggest any adjustments they feel necessary, then agree and approve the design for the business case. The third purpose of the cost model is to provide a vehicle for cost analysis, cost management, and cost control. The model provides a basis for analyzing IT spending, by giving answers to cost questions that are difficult to address with the scenario cash flow statements in the business case. As soon as the cost model structure is in place, the analyst can begin projecting actual cash flow estimates for each cost item, across the business case analysis period. For IT cases, this usually means a period of 3 to 5 years into the future. The scenario cash flow statements will show how cost and benefit projections come together across this time span, but the cost model itself provides another view of anticipated spending that can be very useful for managing and controlling spending. Besides putting the cost estimates into cash flow statements, we can also fill in the cells of the cost model with the total 5-year (or 3- or 4-year) spending expected for the items in each cell and then create totals for each cell, each row, and each column. Table 2 (below), for instance, shows one company’s five-year cost estimates for an IT infrastructure upgrade, with cell totals and marginal totals. Table 2. One company's 5-year cost projections for an IT infrastructure upgrade. The real value of the model lies in the story told by the marginal totals. For instance, more than 73% of the cost impacts come after the initial acquisition. Bringing marginal totals into the picture adds to the model’s value as a tool for financial control. Here, marginal totals show costs by IT resource axis category (vertical dimension) and life cycle stage (horizontal ). Several messages from Table 3 stand out. “People costs” (IT Staff and IT Users together) make up 48.5% of the 5-year cost picture, for instance. Post-acquisition costs make up 73.9% of the total cost story. When planning such a move, the natural temptation is to focus on Hardware and Software acquisition and operation costs (the four cells in the upper left corner of Table 2). Real cost control, however, depends on understanding the implication of these choices on the other cost impact areas, the so-called “hidden costs” of computing. For examples and more on building and using the IT cost model, see Business Case Essentials. Metrics Pro Features the Analyst Workbench & Chairman's View. Usually, the easiest IT benefits to find, quantify, and defend, come from cost savings and avoided costs—benefits that appear when the cost analysis under a Proposal scenario is compared to a cost analysis under a "Business as usual" scenario. These kinds of benefits are usually tied more or less directly several types of IT resource usage. The most significant business benefits from an IT action, however, often lie elsewhere. First, "Benefit" should be defined as an outcome from an IT action that contributes towards meeting a business objective of the company or the organization. Reaching goals has value. Work without a clear business objective in mind does not necessarily have value. First, the IT action outcomes may improve efficiency. Efficiency means either (1) accomplishing specific work at less cost, or (2) increased productivity, i.e., achieving more at the same value. Second, the IT action outcomes may improve the quality or effectiveness of work. This result could be, for instance, improving customer service delivery, product design quality, or advertising effectiveness. Third, the IT action outcomes may enable people or organizations to innovate, that is, engaging in valuable activities they were not able to do before. Fourth, the IT action outcomes may reduce risk (e.g., lowering the risk of service unavailability, lowering the risk of employee accidents, or lowering the risk of losing a competitive advantage). With these two ideas in mind, IT management and IT users are prepared to search for and identify the full scope of potential business benefits from a proposed IT action. Whose Costs and Whose Benefits Belong in the Case? In many IT business cases in government, the case developer is mandated to consider benefits to the population served, as well as cash inflows and outflows to the IT organizations and agencies involved. IT actions in an extensive health care delivery system may have impacts far beyond the IT organization. The work may bring improvements in efficiency and accuracy of billing, and record handling may improve throughout the system, professional service delivery may be better or more timely, the range of services may be more significant, system-wide operating costs may be lower, staff professionalism may be enhanced, and so on.. There is no question that IT actions can have beneficiaries beyond the IT organization. However, it is the case developer’s responsibility to extend the scope of beneficiary coverage appropriately, by agreement with case audience or recipients. For this purpose, Reference Group members can play a critical role. The crucial point is that beneficiary scope is not set automatically by defining the subject of the case. Nor does the cost/benefit analysis itself determine where to place the boundaries of coverage. Do not omit a benefit from the business case just because it is hard to quantify. The goal is to quantify beneficial outcomes, either as financial outcomes or as "tangible" non- financial incomes (e.g., concerning impacts on measurable key performance indicators). It may be difficult in some cases to reach agreement on acceptable quantitative measures of the benefit, but if the outcome indeed contributes towards achieving a vital business objective, it belongs in the case. Do notomit non-financial benefits merely because you cannot give them economic value. An IT outcome may contribute towards meeting a vital business objective that is defined and measured first in non-financial terms. Goals for customer satisfaction improvement, or branding, or reduced risks, for instance, are usually identified and measured first regarding non-financial but essential tangible performance indicators. IT action outcomes that contribute towards meeting these objectives are legitimate benefits for the case, even if they must appear without receiving financial value. Do omit a benefit if it is unlikely or its probability is unknown. If the best you can say is that an outcome "might" contribute towards meeting a business objective, do not include it in case. The presence of "weak" benefits can make the entire case look weak. When You Need a Real Business Case! If you assign no financial value to an agreed benefit, that benefit contributes nothing to the economic analysis. Is this appropriate? Often it is not. The company may invest in technology to improve its professional image, improve customer satisfaction, or create a more professional work environment. But how much credit do these benefits deserve in real money? They will contribute 0 to the case financial summary if an acceptable valuation is not agreed. In a large bank, these objectives refer to substantial cash flow streams. If an IT investment improves performance in any, even by just a few percentage points, the benefits of the IT investment can be massive. A small fraction of a considerable number is itself a large number. Nevertheless, a bank IT director may attempt to cost-justify the investment solely regarding cost savings and cost avoidance (displacement of data entry clerks, for instance, or lower expected hiring rates). The latter benefits are smaller but more accessible to quantify. A good IT business case needs all substantial benefits of both kinds, but often, the significant strategic benefits fall to criticism and get left out. Top-level management may be reluctant to credit IT for reaching strategic business objectives, probably because IT alone may not guarantee the goal. A new network architecture for the bank might help reduce loan losses or help sell more profitable financial services (perhaps by providing timely access to critical customer data), but it is not the only requirement for reaching these objectives. Reducing loan losses may also require changes in the way the bank trains and manages professional staff, is trained and supervised, or changes in loan decision criteria, for instance. However, if the IT action is necessary for reaching the objective, or if it undoubtedly contributes to getting there, IT deserves some of the credit in the business case. That credit will not show up in the case financial summary unless the worth of the contribution appears in monetary terms. Quantifying the worth of the benefit’s effects. For example, a “more professional work environment” (the IT action outcome) may have a highly quantifiable impact on such things as employee turnover—regarding recruiting costs, training costs, and productivity. Using a value that is equal to the cost of alternative solutions. For instance, a commercial bank loan officer must have access to customer credit histories and other business and economic data. Technology brings that information to the desk within a few minutes. What is the value of that IT benefit? Consider the cost of the next most cost-effective means of getting the same results. Setting the value equal to the cost of not providing the benefit. Do everything you can to quantify every essential benefit in financial terms, but include only those that you or your audience can accept with confidence. Financial Modeling Pro. Tutorial, Live Examples, Templates for Your Model! Where does a cost-saving go in the cash flow summary for the business case? Is it a positive inflow appearing under “Benefits”? Or is it simply a reduced cash outflow under “Expenses”? How should you measure projected improvements in the IT business Case? If engineering productivity is expected to improve by 30% with a new software design system, where does the case capture the improvement? How should increases enter the business case? If a new Customer Relationship Management (CRM) system is expected to lead to sale revenues increases of, say 20%, where do we capture those increases? Do we include the expected new sales revenue figures? Or do we add just the addition? Many organizations undertake IT actions to save money, improve productivity, or increase sales. Notice that "saving," "improving," and "increasing" are relative terms. We have to ask: “Savings, relative to what?” Improvements, or increases, relative to what? The “what” is a baseline scenario, which we call “Business as Usual” (Other case builders may use the terms “As Is” and “To Be” to distinguish between “Business as Usual” and Proposal scenarios). In any case, savings, improvements, and increases will only show up as such if we have two scenes to compare. Knowing how to compare two business case scenarios, moreover, requires an understanding of the difference between incremental and full value cost and benefit projections. Consider the two simple cash flow scenarios shown at left in Table 3 (below). Each represents a different business case scenario, “Business as Usual” or Proposal. These are full value scenarios showing the actual total cash flow values for each benefit and expense item. Sales revenues under the Proposal, for instance, appear at its full value, $150. Table 3. Cash flow values for several scenario line items, using a "full value" approach (left) and another "full value" approach (center). Figures in parentheses are cash outflows. = $150 – $120 = $30. From these projections, it appears there will be cost savings in "Customer support" under the "Proposal" scenario. How does the business case author identify and communicate the savings? One approach is to present both full value scenarios (at left) and describe the differences between corresponding line items on both "full value" statements. We can see, for instance, that customer support costs are $20 less under the Proposal Scenario. In the Net cash flow figures at the bottom, we can also see that “Business as Usual” is losing money right now, whereas the Proposal scenario looks forward to a net gain. Notice how “Customer Support” costs are positioned differently under the two different approaches. On both full value scenarios, “Customer Support” is an Expense or cash outflow. We know that support costs are lower under the proposal because we can compare scenarios. Under the incremental approach, however, “Support savings” appear under “Benefits” as a cash inflow. Failure to appreciate the difference is the cause of many business case confusions. One confusion, of course, is the question of what to do with cost savings: Do they go under “Benefits” or “Expenses”? More pervasive, however, is the problem of mixed data: case builders often err by including full values for some line items and incremental figures for others in the same cash flow statement. This mistake is so easy to make that it is always wise to review your cases or those of others to be sure that all data are one kind or the other. Which Approach Should be the Lead Approach? Which approach is more appropriate for the IT business case? First, remember that you will have to create both full value scenarios even if you are going to lead your presentation with the incremental approach: the "Incremental" deltas derive from the "full values," after all. The case primarily serves budgeting or business planning purposes. Here, the analysis must show the total magnitudes of line item numbers as well as the difference between scenarios. There is no viable “business as usual scenario,” or there are many different proposal scenarios to compare. The “cost” side of the cost/benefit case will go into a “Total Cost of Ownership” analysis of its own. The action scenario is viewed more as an investment decision, and management truly wants to weigh costs and expected returns of the action itself, independent of other financial factors in the environment. The incremental costs and returns of the action are small relative to total inflows and outflows. Business Case Guide. Everything Essential For The Business Case! Anyone reviewing an IT business case analysis of any kind—ROI, cost/benefit, Total Cost of Ownership, financial justification, or something else—you should look immediately for several crucial business case elements. Essential elements include a clear statement of case subject and case purpose, the complete cost model for the case, the rationale for valuing benefits (if the business case includes benefits), and a timeline. Figure 2. Projected IT business case results organized along a timeline. Those who read the case or make decisions using its findings will want to know when cash flows and outflows occur in the analysis period. On the one hand, the author may know very well when specific inflows and outflows occur, or when the net impact reaches a "break even" point. On the other hand, the audience and readers also need to see how they happen in time to judge the validity of results and to know best how to apply financial tactics during implementation (reduce costs, accelerate gains, postpone expenses, or increase profits). What is the most appropriate analysis period? Significant IT actions usually have cost and benefit consequences that extend across years, sometimes long after the original hardware and software purchases have been written off and replaced. When an organization chooses a new operating system or a different database architecture, for instance, the choice may limit or direct IT planning options through several cycles of CPU upgrades or software versions, a period of an impact that covers 3-5 years at least. Business case results are always uncertain to some degree because they project events into the future. They are estimates based on other estimates: IT cost projections for the next several years may derive from estimated capacity growth, estimated transaction volume, and predicted future prices, for instance. Your estimated benefits may reflect expected business performance, market changes, and competitor actions that haven’t happened yet and which are controlled by many factors. What are the chances of seeing other results besides your main predicted outcome? What are the risks to achieving these results? What can we do to maximize the results? A standard approach is merely to set higher "hurdle" rates or require shorter payback periods for proposals under consideration. When decision makers take this approach, however, without an eye on the individual risk components, the accuracy of the business case and the ability to control risk suffer. Describe the likelihood the variable will have different values between its minimum and maximum (in statistical terms, describe the probability density function for the input variable). “We have a 90% chance of realizing a net gain of at least $2 million." Figure 3. Probability curve from a Monte Carlo simulation analysis on the financial model underlying the IT business case. The curve shows the probability (vertical axis) that cash flow results will equal or exceed a given cash flow total (horizontal axis). “We are “90% confident that the net results of this investment will be a cash flow gain of $2,500,000 to $7,500,000. Such statements may be more useful to management than a single “best estimate.” If a gain of $2 million is as a “good” result, and there’s a 90% chance of achieving it, the decision to go forward may be easy. If the action absolutely must return $5 million or more, than a 50% risk may be unacceptable. It is possible to develop this kind of information about overall results only when you know something about individual risk factors. Should you or your audience believe such results? Like all statistics, of course, the simulation output (the curve in Figure 3) is no better than its input. The “input” to the analysis includes the financial model behind your cash flow projections and the level of uncertainty that you assign to each assumption. If you can make plausible assumptions about the possible and likely values of individual risk factors, then the resulting results curve is a significant contribution to the validity and practical value of your case. This question is usually more natural to answer once you have completed your “best estimate” business case if your case cash flow model is in spreadsheet form. The first step is to find out which cost/benefit line items and which specific assumptions or inputs have the most impact on overall results. Once you know which of these largely control the "bottom line" you can create plausible pessimistic and optimistic combinations of the input factors and test their impact on the case outcome. More sophisticated statistical-based sensitivity analyses will adjust results automatically, recognizing that some of your assumptions correlate with each other (expected inflation rates, price changes, and salary increases might be such an example). Management intervention (changes to the implementation plan) may be called for if these factors change in a way that puts the predicted results at risk. Those which you can influence or control to some degree. These might include such things as skill levels of your professional staff, timely completion of related projects, achieving cost control goals, recruitment and hiring of key individuals, and many others. These factors need constant management attention. No matter how hard you try to put a value on every IT benefit (see Key 4 above), some will probably remain unquantified, at least in financial terms. Such benefits may include improvements in corporate image, customer satisfaction, or employee morale. These may represent primary corporate objectives, and reaching them will no doubt translate into lower costs and increased revenues. Nevertheless, you and your audience may not be ready to accept monetary estimates for them with confidence. These benefits will not enter the business case financial summary or cash flow statements, but they may still deserve consideration in the proposal. For non-financial benefits that meet these criteria, here are some brief guidelines on how to use them effectively in the IT business case. •	Make the impact tangible. Describe the benefit in ways that can be seen and verified, even if not in monetary terms. You may expect a real “improvement in staff professionalism,” for instance, but you may not be able to evaluate the value of that in monetary terms. You can, however, describe the likely effects of that benefit in other observable terms, such as lower staff turnover, easier recruiting, less absenteeism, or the appearance of the workplace to customers or clients. •	Connect the impact with business objectives and business case results. Ideally, your business case document should start with an introduction that presents the objectives, opportunities, or problems addressed by the subject of the case. When you identify the non-financial benefits of your proposal, connect them directly to this introductory material, especially in the “Conclusions and Recommendations” section of your business case report or presentation. •	Emphasize the financial or other business value of the objective, even if you cannot assign a known fraction of that value to the benefit. By taking these steps, you are merely reminding your readers or audience, in effect, that good business decision making is often more than a simple matter of weighing financial sums. No matter how well you prepare yourself or your case-building team, your next IT business case will probably not be your best one. The one after that will probably be better—more accessible, easier to understand, and more accurate. Individual and organizational learning are requirements for perfecting the case-building process, and some of that learning has to come from experience. From repeated trials over time, you will learn how best to refine the cost model and how to assign cost and benefit values to IT actions appropriately for your situation. By consistently using the same approach to business case design, over time, your organization should improve its ability to understand and use case results effectively, and with confidence. Unfortunately, too many people and too many organizations begin each case-building project starting from 0. One way to learn from experience—and establish a consistent approach to case design and case methods—is to use the case as a financial control tool throughout the lifetime of its subject. The business case that justified an IT acquisition or action can live on, long after the initial decision, as the heart of a powerful tool for managing the consequences of that decision. Expected cash flow items and other elements can be linked into a dynamic business model for tracking, controlling, and measuring IT costs and benefits. Cost and benefit cash flow estimates derive from assumptions—many assumptions in some cases—about such things as future labor costs, business volume, transaction volume, service provider prices, insurance premiums, and so on. As time progresses, these will almost certainly change from the values assumed when business case results first appear. Regular updating of the assumptions underlying cost and benefit estimates will keep cash flow projections more accurate. Validate Cost Model Structure and Content (see, for example, Table 1). You will want to pay attention to questions like these: Do cost line items in the same cell, in fact, change together? Does management plan these items together? Are some rows and columns of the model so insignificant that they can be dropped or merged with others? Are there significant cost categories missing from the original model? Where there is a gap between prediction (the business case) and actual results, ask if the estimate drew upon faulty assumptions (e.g., an assumed need for storage capacity) or whether the costing of that resource was off the mark (e.g., not anticipating hardware price changes). Pay attention especially to the timing of benefits and their actual arrival. Was everything online and running as planned? Did productivity “ramp up” as expected? Of course, the analyst will adjust specific figures as plans turn into history, but the underlying framework for evaluating the IT business performance impact should not change much over several years. This situation makes it possible to accomplish many of the objectives discussed in Keys 1-9: keeping individual risks in view, reducing costs, increasing gains, accelerating gains, and tactfully keeping your Reference Group and other managers aware of their joint responsibilities in delivering IT business benefits. The nine keys above work with most good approaches to business case building. They are especially applicable, however, with the business case structure and content presented in Business Case Essentials (www.business-case-analysis.com/business-case-essentials.html). The complete, concise guide to what belongs in your case and why. The trusted authority on business case analysis with clear, practical, step-by-step guidance. BC Essentials. The Best-Selling Case-Building Guide in Print! Integrated Word, Excel, and PowerPoint Template system designed to help you build a professional quality case quickly and easily. Templates 2019 – Sometimes You Need a Real Business Case! Clear, practical, in-depth coverage of the case-building process and cost-benefit methods. The standard source for industry, government, and non-profit organizations worldwide. The BC Guide. Everything You Need to Know About the Business Case. Handbook, textbook, and live templates in one Excel system. Complete usage and implementation of ROI, IRR, Working capital, EPS, and 150+ more cash flow and financial statement metrics. A complete tutorial on building financial models for estimating costs, benefits, and business case results. Live examples and templates for your models. Modeling Pro – The Living Model Makes Your Case! Finish time-critical projects on time with the power of statistical process control tracking. The Excel-based system makes implementing project control charting easy to use—even for those without a statistical background. Progress Pro — When the Project Simply Has To Finish On Time! Find Premier Business Case Books, SW, and Templates at the Master Case Builder Shop. Proven practical guidance for your case-building projects. Phone or write Solution Matrix Ltd any time for product support. Ebooks and software from the Master Case Builder ship with lifetime customer support and replacement insurance. Join the premier seminar on business case analysis. Earn professional education credit while building your case. Download case-building books and software when you register! Join the Master Class in London, New York, or Washington DC.